For the braids I used parachute cord , which comes in tons of bright colors and very thin white rope. I loved the result of both, but the parachute cord is a little bit more sturdy. To make this necklace— 1. Start with 8-12 strands of rope or parachute cord that are each 8 inches long. Tape the ends of one side down to a table or use a clipboard to secure them. 2. Divide the rope into three sections and braid them. Be sure to keep the strands flat and untwisted as you braid. 3. Tape the ends of the rope with fabric tape. 4. Attach chain to each end (you’ll need to add a clasp in the middle of the chain as well) and add more tape, creating a cone shape at the end of each side. Optional: Coat the tape with tripe thick glaze and use gold leafing on over the tape. 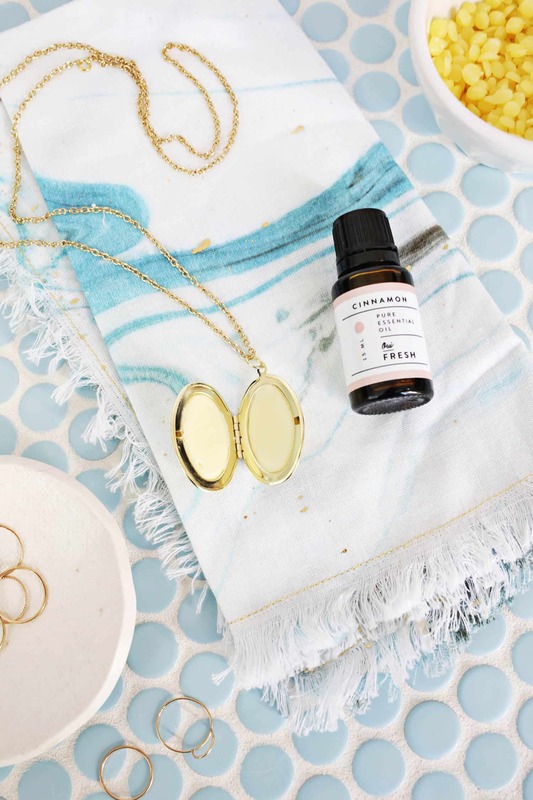 (Learn more about gold leafing here) Be sure to add another coat of glaze at the end to seal it and allow it to cure completely before wearing. I used the extra rope and cord to wrap some vases for my home. Sometimes trying to think of a way to use extra supplies after a project is almost as much fun as the project itself. 🙂 PS. I love carnations right now. Wow, I love this! I’m definitely going to make one of these. I love that, the after-project ~ sounds like an after-party. 😀 The rope is adorable as a necklace and a vase cover. I LOVE this statement necklace. Such a fun project! Really want to make one of these ASAP! Gorgeous. I love this idea!! I’m a huge fab of anything nautical so I’ll be sure to try this soon!! These are fun! I am loving the hot pink/gold combo, which is totally not my usual taste. Wow these instructions are a lot easier than I expected them to be! Thanks for sharing! I am a little confused about the clasp part. Can someone explain that part better to me? You connect the clasp to the chain. I get that but what do you use to connect it to the rope? What are you connecting it to? the rope? the tape? My brain is not connecting the dots. Oh my goodness, that hot pink is just PERFECT! So easy and adorable! thanks for the inspiration! Wanda Wolmar – The chain is sewn on to the fabric tape. To add a clasp in the middle of the chain you just need jewelry pliers and a jump ring. Check the link in the post for more details. Good luck! So cute. I’ve been meaning to pick up some paracord for jewelry projects. Love the cord-wrapped vases…just in time for Earth Day! ooh so cool! the gold leafing makes it look so professional! Pretty! I like it a lot. Wow, this is so easy and has such a great effect! 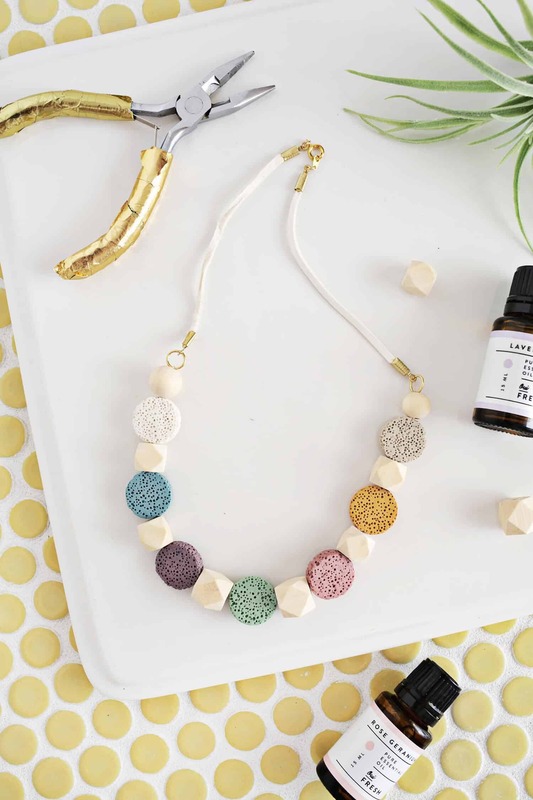 This necklace looks just as good as store bought – no one would ever know the difference!! Plus + it would be tons cheaper too! Win win! Great the idea for the vases, reusing! Oo, that looks so nice and original. I like things like that. Perfect idea. Have a nice weekend. The vases are very cute, this is such a good idea to decorate them. The pink necklace is ah-mazing!!!! And I love those vases, they look fantastic. I do not think I can pull off the large rope necklace, but I adore those vases. So cute. I saw these on Pinterest and fell in love a while back. Great to use up the left overs guys. aww i really like these! so cute! I love the ropes on those vases! What an amazing idea, so beautiful for spring! This is such a great idea. I love the white one! Fabulous! What a great way to add some colour to an outfit – I’m going to have to do some experimenting. Love the white one! So making this for my BFF! This is amazing, it looks so professional! Another simple easy diy thank you! I really like your blog .. congratulations! beautiful creations! I invite you on my blog .. http://noxcreare.blogspot.it .. let me know what you think .. I’m also a creative!! Those carnations are beautiful!! Obsessed with hot pink at the moment- must try this necklace tutorial out. Love this!! Thanks for the tutorial! Such a good idea, looks really good too. Such a great idea! Love the vases too! So fun and nautical! Perfect for spring and summer! Those necklaces are so cute, such a great idea! So cute, I’m going to make one right NOW! ahh I love the pink version!! this looks so cool! i really want to try it out! Saw really cool bundles of rope at a bazaar yesterday and now I really regret not getting at least one! In my first year of high school, I used to give 5 of my friends a carnation each every Monday 🙂 Kind of forgot about that, so thanks for the post. Very cool idea! I love it! Thanks for sharing! I love the neon pink pop of colour, so cute! It would be just about perfect and I've been searching and searching but haven't been able to find the right recipes. Also I am in love with all your Seychelles shoes, they are absolutely adorable. You guys are beautiful! Its so cool. One wouldn’t really think rope would make such amazing art. A must try! Perfect way to use rope! Great idea! OMG what a great idea! I will try it out. Or you could use a large metal cone on the end. Take a eye pin, twist it around the rope, with the eye out for the chain, put a large blob of glue on the ends of the rope and push the cone on over the eye pin and the rope. Let dry. YEY!That`s what I was looking for! 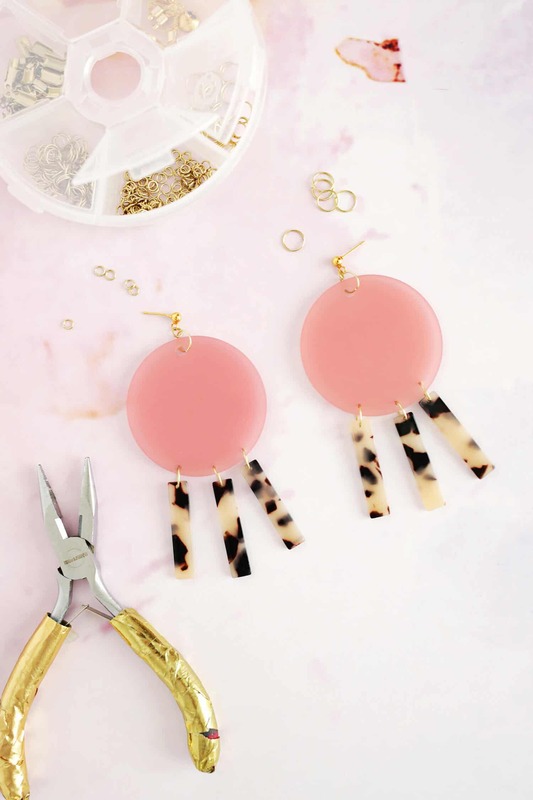 I just absolutely love this DIY,especially the first neon pink necklace! The pink one is beautiful! I love them! Now I have to make some for myself! I love it….all of it! I love the use of paracord! When using just plain rope you could add fabric stiffener and it might help it stay in place easier. Simply lovable statement necklaces! Thanks 🙂 Definitely gonna make a poppin’ pink one! I really want to make one of these! I’m not quite sure how to sew the chain to the fabric tape. Is there a link I’m missing that explains that. Thanks! Love your blog! Wooow thats a really good idea. I will try that necklace!